Deck Hardware consists of a variety of items to either decorate, streamline, clean-up or repair your boat. Railing and stanchion fittings and mounts are a prime example. Made of marine grade stainless steel (316), these railing and stanchion fittings come with the set screws required to clamp them onto the standard 7/8 inch tubing used in marine railings. Ships Bells by Seafarer comes complete with hanger and wall bracket for easy installation. These 6 inch ships bell are decorative for your home, office or bar, or can be attached to your boat for a tradional nautical look. Makes a great gift for the mariner in your life. Chrome or Brass, 6 in. diameter. Flag pole holders and fishing rod holders are additional specialty deck hardware that serve specific projects. Flag pole holders are brass, and are the standard diameter for teak or wooden ensign and flagpoles. Fishing Rod holders are chrome, and come either flush mounted or regular. 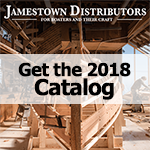 Many of the deck hardware available is from marine industry leaders like Perko, Sea Dog, ABI, Seafarer, Edson, and Moeller.